Nintendo DS Star Wars Styli Come In Regular Or Light Up Versions | OhGizmo! Star Wars MP3 Player… Lame! I know in the past I’ve lamented at some of the Star Wars merchandise that Lucasfilm has approved, but sometimes Star Wars + (insert random item here) just seems like a match made in heaven. 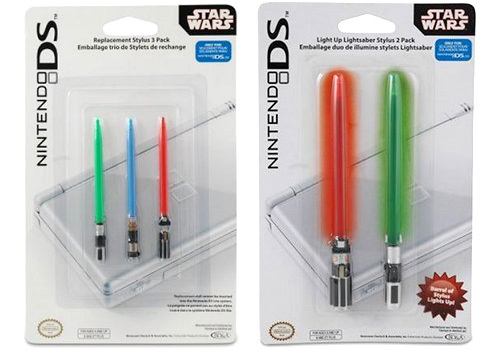 And these lightsaber themed replacement styli for the Nintendo DS definitely fall into that latter category. While I’ve already replaced my stock DS stylus with a longer one from my old Handspring Visor, you better believe it’s about to get upgraded again. The lightsaber styli appear to be officially licensed by both Lucasfilm and Nintendo, and come in either a 3-pack that includes Luke, Obi-Wan and Vader’s lightsabers, or a 2-pack with just Luke and Vader’s sabers that actually light up! Amazon.com claims that both sets will be released on July 31 but you can pre-order them right now. The 3-pack costs $7.99 while the light-up 2-pack costs more than twice that at $16.99.